“I still have many things to say to you but they would be too much for you now. “If you are guided by the Spirit you will be in no danger of yielding to self-indulgence, since self-indulgence is the opposite of the Spirit. …. When self-indulgence is at work the results are obvious: fornication, gross indecency and sexual irresponsibility; idolatry and sorcery; feuds and wrangling, jealousy, bad temper and quarrels; disagreements, factions, envy; drunkenness, orgies and similar things. I warn you now, as I warned you before: those who behave like this will not inherit the kingdom of God. “You can follow thousands of catechism courses, thousands of spirituality courses, thousands of yoga or zen courses and all these things. But none of this will be able to give you the freedom as a child (of God). “Dear young people of Scotland!…. Who is this Holy Spirit? He is God himself. The Third Person of the Blessed Trinity. He is sent to each of us by the Father and the Son. He is their greatest gift and he remains constantly with us. He abides in us. The clearest description of the work of the Holy Spirit has been given by Saint Paul, who said that the Spirit produces “love, joy, peace, patience, kindness, goodness, trustfulness, gentleness and self-control” (Gal 5:22). Qualities such as these are ideal in every walk of life and in all circumstances…. With gifts and qualities such as these we are equal to any task and capable of overcoming any difficulties. Yet our lives remain our own, and the Spirit acts on each of us differently, in harmony with our own individual personality and the characteristics we have inherited from our parents and from the upbringing received in our homes. Because he is so near to us, yet so unobtrusive, we should turn to the Holy Spirit instinctively in all our needs and ask him for his guidance and help. God has sent him to us because of our helplessness, as Saint Paul says so beautifully: “The Spirit too comes to help us in our weakness. For when we cannot choose words in order to pray properly, the Spirit himself expresses our plea in a way that could never be put into words” (Rom 8:26). What more could God do for us? What more can we expect of God than that? “The Holy Spirit… has summoned us, invited us, given us the opportunity and the duty to offer the best of ourselves. The Spirit does not abandon us. He becomes one with us, so that we can encounter paths of new life. “There is a variety of gifts but always the same Spirit; there are all sorts of service to be done, but always to the same Lord; working in all sorts of different ways in different people, it is the same God who is working in all of them. The particular way in which the Spirit is given to each person is for a good purpose. One may have the gift of preaching with wisdom given him by the same Spirit; another may have the gift of preaching instruction given him by the same Spirit; another again the gift of healing, through this one Spirit; one the power of miracles; another prophecy; another the gift of recognising spirits; another the gift of tongues and another the ability to interpret them. “As Pope Benedict XVI reminded us so many times in his teachings, and at the end by his courageous and humble gesture, it is Christ who leads the Church through his Spirit. 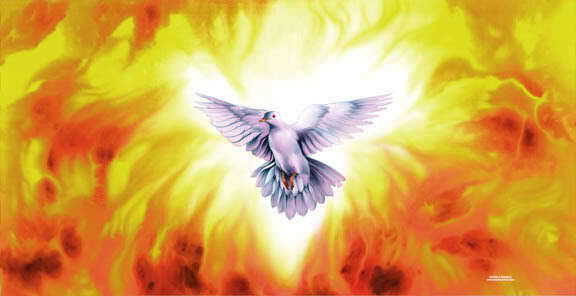 “We cannot bear witness without the presence of the Holy Spirit in us…. In difficult times, where we have to choose the right path, where we have to say ‘no’ to a lot of things that maybe try to seduce us, there is prayer to the Holy Spirit, and He makes us strong enough to take this path of witness.